Leaving Switzerland on Swiss Air, which has to be the best airline ever. We got two delicious meals, an ice cream snack and swiss chocolate. Plus the planes are squeaky clean and the people are very helpful and pleasant. 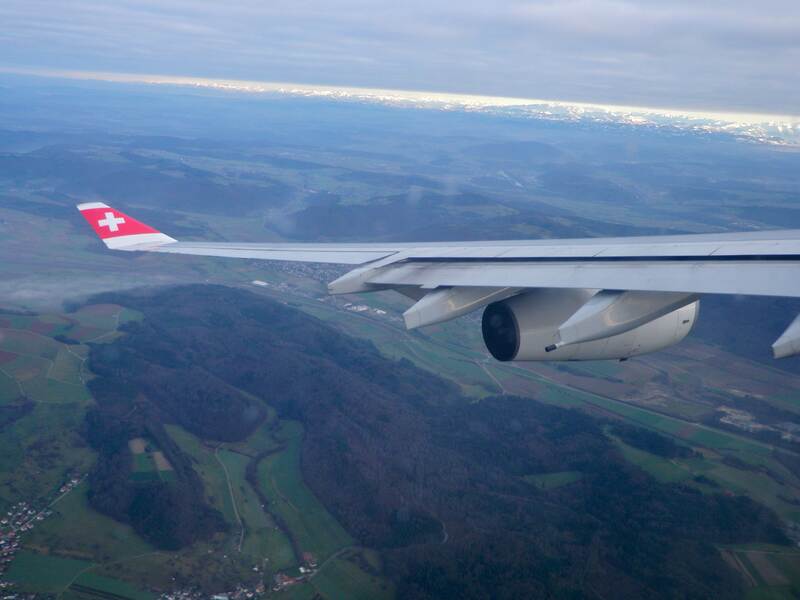 I might start a policy of always flying into Zurich when I go to Europe! I’ve always been really lucky with air travel. I fly domestically a couple of times a year and internationally once a year. I’ve never missed a flight (though I’ve had to run for a few connections), never had major weather problems, never been hassled by security or customs, never been trapped on the tarmac for more than a few minutes and never had my luggage lost or stolen. Yesterday, on my way home from Zurich, my luck ran out. I flew from Zurich to Chicago, then Chicago to Denver and when I went to check the gate for my flight home to Albuquerque, there was no flight to Albuquerque. Oh crap. 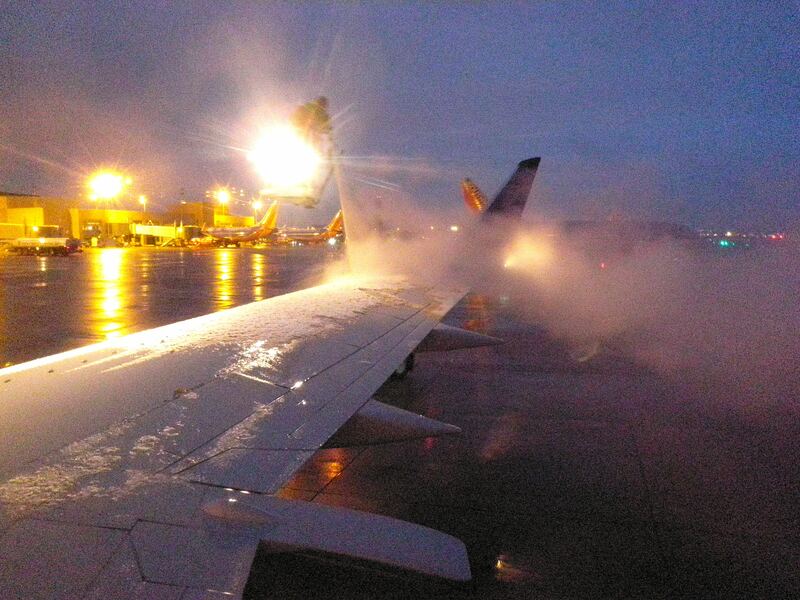 This was a bit disconcerting: deicing the wings in Denver on a flight home last winter. If you ever have flight issues, go directly to the customer service desk for the airline. They can help you and approve any changes faster than anybody else. So I headed to the Frontier help desk, but they were as confused as I was. My itinerary from the ticket company said I was scheduled on a 9:25 pm Frontier flight from Denver to Albuquerque, but there simply was no evening flight. The last flight had left at 3:20 pm, when I was still over the Atlantic. Frontier then sent me to United, who might have been able to get me on another flight, but to no avail. Their last flight had left an hour before I landed. They said they could book me for a flight the next day, but that I would have to pay $75 to change the ticket. No way in hell. So I went back to Frontier, who had a flight leaving first thing the next morning that wouldn’t require further payment. I should also mention that Frontier and United are in two different terminals so I was riding a train back and forth all over the Denver airport trying to figure out how I was going to get home. Once I determined there was no way I was getting out of Denver that night, I set about getting somebody to pay for a hotel room. Somebody screwed up my flights and it wasn’t me and after 20 hours of flying, I wasn’t going to camp out in the airport. The very helpful woman at the Frontier help desk did some investigating and found that the airline had canceled my flight way back in October (I bought my ticket in September) due to low ticket sales and had rescheduled me for the afternoon flight to Albuquerque, despite the fact I didn’t get into Denver until after 8 pm. Not only had they rescheduled me for this physically impossible feat, they also failed to tell me about it. After all that, the woman at the help desk said all she could offer me was a hotel voucher for a discounted room and that I would have to get reimbursed from the ticket booking service, who had failed to notify me of the schedule change. I knew if I shelled out, I had a snowball’s chance in hell of ever seeing that money again. I asked to speak to her supervisor, who was able to approve a free hotel room nearby. He was reluctant, but I insisted. 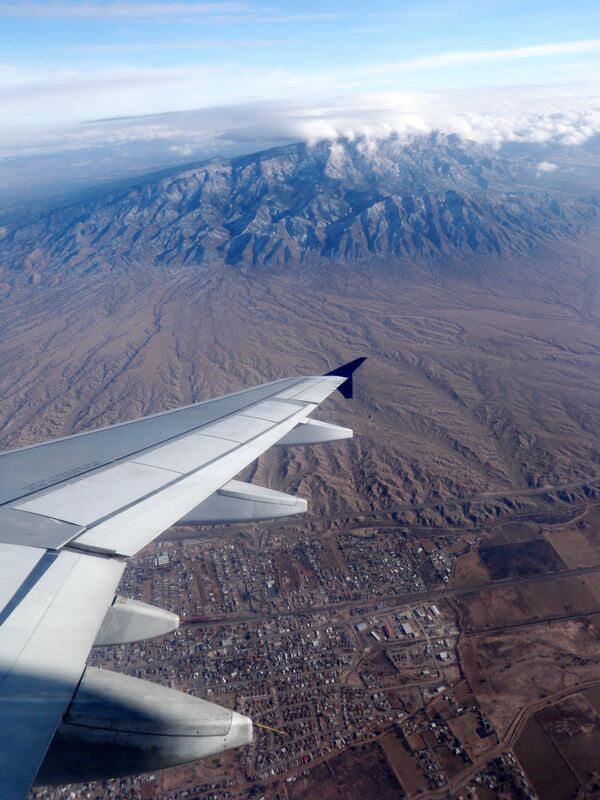 When it comes to air travel, or really any kind of travel, you have to stick up for yourself. Air lines will never offer more than you ask for so make sure you ask and keep asking politely, patiently and persistently! Try to keep in mind it’s rarely ever the fault of the person at the help desk and they are usually only authorized to offer so much, so keep asking for supervisors until you find somebody who believes in the importance of customer service. And remember: it can always be worse. Thanks Frontier! It’s so nice to have finally made it home sweet home! It’s nice to know that if I had paid for a hotel room, I could recoup that cost, but I will not be booking through Vayama again. This entry was posted in Beyond the USA, New Mexico, Photography, Vagabonding 101 and tagged air travel, itinerary change, missed flight. Bookmark the permalink.